As I've said before I suspect the Polar Magnetic and upper atmosphere electro magnetic activity has more to do with Global Warming than Cow Farts or Ocean Crossing Choo Choo Trains. Where's that Global warming chart, that shows rising temps in the same period our magnetic north is shifting up over Russia. Exposing more of the Polar ice sheet to the Sun. Do not understand- Why would the magnetic north pole have anything to do with sunlight. The earth revolves around the geographic north pole which does not change. It’s not direct sunlight he’s referring to, but charged ions that direct themselves around the magnetic poles. These are also responsible for the aurora borealis which appear as waves of dancing light across the sky. I’ve seen these many many times. I don’t see the connection he’s making with the global melting though, unless he’s saying the charged particles decaying in the atmosphere at the poles is causing extra warming there? Ironically, the only times the Northern Lights are visible is in the dead of winter when it’s dark at night. Of course that doesn’t mean they aren’t active at other times I suppose. Do not understand- Why would the magnetic north pole have anything to do with sunlight. Still do not understand. 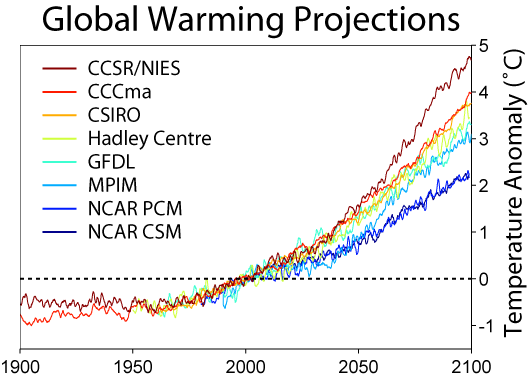 The latest graph you posted shows the projected increase in temperature until 2100. How does that correlate to the movement of the magnetic north pole. The amount of sunlight does not depend on the magnetic north pole position.